Regular exercise causes your body to make adjustments that result in improved health and physical functioning. Continuing with regular exercise enables your body to maintain these benefits. Regularly doing the right types of exercise at the correct intensity, and for an appropriate duration, provides more benefits. The benefits of aerobic exercise can be broadly categorised as either ‘fitness’ (physical capacity) or ‘health’. Fitness and health are linked, and most forms of aerobic exercise will help you achieve both. Regular aerobic exercise improves your cardiovascular fitness by increasing your capacity to use oxygen. It does this by increasing your heart’s capacity to send blood (and hence oxygen) to the muscles. This is mainly achieved through an increase in the size of the heart’s pumping chambers (ventricles), which means that your heart doesn’t have to beat as fast to deliver the same amount of blood. This is evident in a lower resting heart rate, and a lower heart rate for the same exercise intensity. As you get ‘fitter’, particular activities (such as walking or jogging at a specified speed) will become easier. You’ll also be able to undertake the activity for longer (known as endurance) and/or at a higher intensity jogging at a faster speed. The same applies to activities such as cycling or swimming, but it should be noted that fitness tends to be specific. So jogging will provide only limited benefits to your fitness and vice versa. However, a side-benefit you may notice is that you also have increased stamina for the everyday activities of life, not just for exercise. Other fitness improvements occur in the exercising muscles, and are specific to those muscles being used in the mode of exercise, such as walking, running, cycling, or swimming. These include an increased capacity for the muscles to take up and use the additional oxygen being delivered by the heart. Regular aerobic exercise has been shown to reduce the risk of heart disease, high blood pressure, type 2 diabetes, colon cancer and breast cancer. It can lower blood pressure and improve your blood cholesterol by reducing the levels of LDL- the ‘bad’ cholesterol and increasing the amount of HDL, the so-called ‘good’ cholesterol. It can also reduce anxiety, stress, and depression, as well as instil a general sense of well-being. Regular aerobic exercise has even been shown to have the potential to increase lifespan. Low-impact aerobic exercise such as swimming is valuable for improving general health and fitness in people who have arthritis or other conditions that limit their ability to do weight-bearing exercise. Importantly, whereas fitness tends to be quite specific, many health benefits can be gained from any form of aerobic exercise. Additionally, the health gains can be achieved from relatively moderate amounts of exercise, moving from a lifestyle involving no exercise to one that involves some exercise that can lead to substantial improvements in health. Aerobic exercise burns up energy. Regular sessions of 30 to 60 minutes of low to moderate intensity aerobic exercise (at around 55 to 70% of maximum heart rate) can be an important part of a weight loss or weight management that is also mindful of the energy (calories) consumed as food. However, many of the health benefits associated with aerobic exercise occurs independently of weight loss. Evidence from large studies has shown that active, overweight people are not at a greater risk of disease than inactive people who are not overweight. From a health perspective, it is of course best to be both active and within the healthy weight range, but if weight reduction is a problem, it doesn’t mean that the exercise is not having any benefit. Your risk of osteoporosis (excessive bone thinning as you age) can be reduced by regular weight-bearing aerobic exercise such as brisk walking. By stimulating the growth of tiny blood vessels in the muscle tissues, aerobic exercise has also been shown to lessen the pain experienced by people who have fibromyalgia or chronic low back pain, as the oxygen supply to the muscles is improved and waste products are removed more efficiently. Regular aerobic exercise can have social benefits too, whether you walk with a friend, play tennis with workmates, or form a social cycling team. 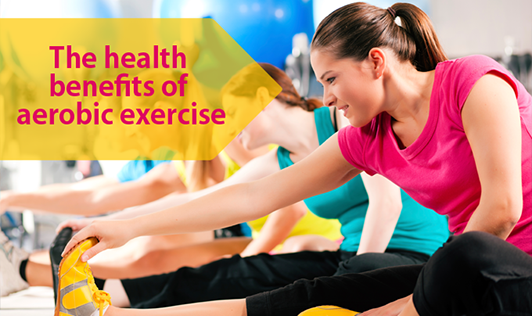 Exercising with friends can also be the most effective way of ensuring that you do it regularly. As with any form of exercise, be aware that over-exercising (either by doing aerobic exercise too hard, for too long or too often) can lead to injury, and cause you to stop working out altogether. Remember to build up gradually from your current activity level, and not to progress too rapidly.